This article is about the royal family. For the territorial state over which it ruled, see Ptolemaic Kingdom. The Ptolemaic dynasty (/ˌtɒlɪˈmeɪɪk/; Ancient Greek: Πτολεμαῖοι, Ptolemaioi), sometimes also known as the Lagids (/ˈlædʒɪdz/) or Lagidae (/ˈlædʒɪdi/; Λαγίδαι, Lagidai, after Lagus, Ptolemy I's father), was a Macedonian Greek royal family, which ruled the Ptolemaic Kingdom in Egypt during the Hellenistic period. Their rule lasted for 275 years, from 305 to 30 BC. They were the last dynasty of ancient Egypt. Dates in brackets represent the regnal dates of the Ptolemaic pharaohs. They frequently ruled jointly with their wives, who were often also their sisters. Several queens exercised regal authority. Of these, one of the last and most famous was Cleopatra ("Cleopatra VII Philopator", 51–30 BC), with her two brothers and her son serving as successive nominal co-rulers. Several systems exist for numbering the later rulers; the one used here is the one most widely employed by modern scholars. Ptolemy VIII Physcon (170–163 BC, 145–116 BC) married Cleopatra II, then Cleopatra III; temporarily expelled from Alexandria by Cleopatra II from 131-127 BC, then reconciled with her in 124 BC. Cleopatra ("Cleopatra VII Philopator", 51–30 BC) ruled jointly with Ptolemy XIII Theos Philopator (51–47 BC), Ptolemy XIV (47–44 BC) and Ptolemy XV Caesarion (44–30 BC). Ptolemy Keraunos (died 279 BC) - eldest son of Ptolemy I Soter. Eventually became king of Macedonia. 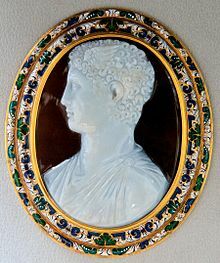 Ptolemy of Mauretania (died 40 AD) - son of King Juba II of Numidia and Mauretania and Cleopatra Selene II, daughter of Cleopatra VII and Mark Antony. King of Mauretania. Contemporaries describe a number of the Ptolemaic dynasty members as extremely obese, whilst sculptures and coins reveal prominent eyes and swollen necks. Familial Graves' disease could explain the swollen necks and eye prominence (exophthalmos), although this is unlikely to occur in the presence of morbid obesity. This is all likely due to inbreeding within the Ptolemaic dynasty. In view of the familial nature of these findings, members of this dynasty likely suffered from a multi-organ fibrotic condition such as Erdheim–Chester disease or a familial multifocal fibrosclerosis where thyroiditis, obesity and ocular proptosis may have all occurred concurrently. ^ Jones, Prudence J. (2006). Cleopatra: A Sourcebook. University of Oklahoma Press. p. 14. They were members of the Ptolemaic dynasty of Macedonians, who ruled Egypt after the death of its conqueror, Alexander the Great. ^ Pomeroy, Sarah B. (1990). 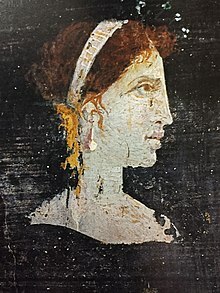 Women in Hellenistic Egypt. Wayne State University Press. p. 16. while Ptolemaic Egypt was a monarchy with a Greek ruling class. ^ Redford, Donald B., ed. (2000). The Oxford Encyclopedia of Ancient Egypt. Oxford University Press. Cleopatra VII was born to Ptolemy XII Auletes (80–57 BCE, ruled 55–51 BCE) and Cleopatra, both parents being Macedonian Greeks. ^ Bard, Kathryn A., ed. (1999). Encyclopedia of the Archaeology of Ancient Egypt. Routledge. p. 488. Ptolemaic kings were still crowned at Memphis and the city was popularly regarded as the Egyptian rival to Alexandria, founded by the Macedonians. ^ Epiphanius of Salamis, however, puts the total number of years of the Ptolemy dynasty at 306. See: Epiphanius' Treatise on Weights and Measures - The Syriac Version (ed. James Elmer Dean), University of Chicago Press 1935, p. 28 (note 104), or what was from 306/5 BCE to 1 CE. ^ Walker, Susan; Higgs, Peter (2001), "Painting with a portrait of a woman in profile", in Walker, Susan; Higgs, Peter (eds. ), Cleopatra of Egypt: from History to Myth, Princeton, N.J.: Princeton University Press (British Museum Press), pp. 314–315, ISBN 9780691088358. ^ Fletcher, Joann (2008). Cleopatra the Great: The Woman Behind the Legend. New York: Harper. ISBN 978-0-06-058558-7, image plates and captions between pp. 246-247. ^ Pfrommer, Michael; Towne-Markus, Elana (2001). Greek Gold from Hellenistic Egypt. Los Angeles: Getty Publications (J. Paul Getty Trust). ISBN 0-89236-633-8, pp. 22–23. ^ Wasson, Donald (February 3, 2012). 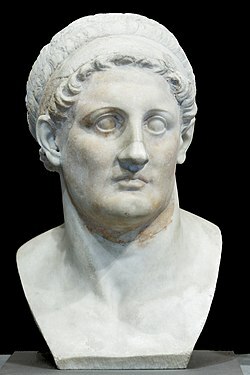 "Ptolemy I". Ancient History Encyclopedia. Retrieved October 1, 2016. ^ Ashrafian, Hutan (2005). "Familial proptosis and obesity in the Ptolemies". J. R. Soc. Med. 98 (2): 85–86. doi:10.1258/jrsm.98.2.85-a. PMC 1079400. PMID 15684370. Livius.org: Ptolemies — by Jona Lendering.